This co-pack of products uses Mold-Care to kill and help prevent mold along with Bora-Care to combat wood-decay fungi as well as termites and other listed wood-destroying organisms (WDOs). During new or remedial construction, a solution is topically applied to all wood surfaces in the structure per the label. 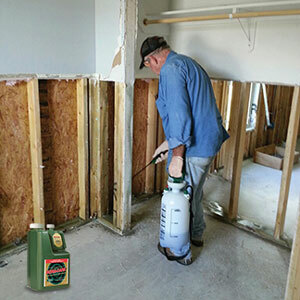 After flooding, treat all exposed wood to kill mold and help prevent future mold growth.